Can a Supposedly Unbiased Softball Interview Television Special Possibly have a Biased Agenda? Apparently so when it involves Governor Palin. On Thursday night was Barbara Walters yearly special The 10 Most Fascinating People on ABC. For the third year in a row, Governor Palin was one of the ten people profiled on the special. We posted the interview here last night. Barbara Walters edited the hell out of that interview with @SarahPalinUSA. It would be nice if they released the whole thing.They cut out @SarahPalinUSA’s full answer about her reading habits among other things. Let’s see the whole thing, ABC. Come on. During the very short portion of Walters’ interview with Sarah Palin that was shown to the public, Walters managed to refer to Palin as “scary,” “polarizing,” and “uniformed” (twice). She also regurgitated the “what do you read?” question, blamed Palin for Republicans not taking the Senate (wait, I thought the media would make someone a hero if they thought they saved the Senate for Democrats! ), and questioned the validity of her marriage. All of this happened on a special where the toughest question is generally “whom are you dating?” and coming right behind an entire hour where Oprah wasn’t asked about any of the numerous scandals from her twenty-five-year career. OK, so ABC and Barbara Walters are biased against Sarah Palin. Obviously this is not news. However, what should be “news” is that Walters would have the audacity to twice refer to Palin as “uniformed.” This was outrageous not just because Walters didn’t even attempt to give an actual example of Palin being “uninformed,” but also because Walters herself has proven to be comically “uniformed” when it comes to alleged Palin transgressions. To be fair there were some good parts in the interview which showed Governor Palin in a positive light, for example when The First Dude husband Todd joined them to talk about their life together and wonderful marriage and family. However, we don’t know and will probably never know how much positive content of the interview was left on the cutting floor. Yes, this Unbiased Softball Interview Television Special had no biased agenda to show that Governor Palin is “uninformed” or hide that she reads certain books. 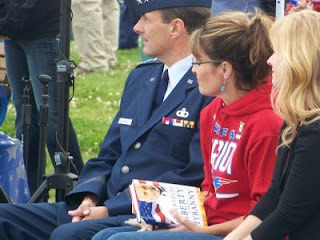 I would hope after 2+ years of debunking this ridiculous narrative the public will finally realize Governor Palin is VERY informed and reads many kinds of books and publications. Again, it’s also interesting to note to the viewers of this Unbiased Softball Interview Television Special that the host of the show that has years of experience as a so called journalist is the one “uninformed” about Governor Palin.